The J-term course, “Olympic Quest”, took students and professors to Korea, Japan and China, on an adventure to discover past Olympic sites. Our journey started with a 14 hour flight from Chicago to Beijing. We landed at night and since Beijing is home to almost 22 million people, it was still lively as ever. Peking duck is the most famous food throughout all of Beijing, so it was only fitting that it was the first meal that we had once we arrived. The next day we all woke up as refreshed as we could be, considering the 13 hour time difference from home, and were ready for our full first day exploring China. We kicked off our trip by visiting Tiananmen Square, the Forbidden City which was the former Chinese palace, a Hutong village where we enjoyed authentic Chinese and went on Rickshaw rides. We ended our day by visiting the Temple of Heaven where the emperors of the Ming and Qing dynasties worshipped for the entire nation for good harvests and blessings for their people. The following day we drove an hour to hike the Great Wall of China. Knowing the mortar was constructed out of sticky rice, egg whites, and lime, made it that much more surreal to be there. It stretched for what seemed like miles and the view was incredible. 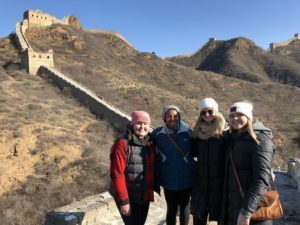 Students were able to check off items on their bucket list, including walking part of the Great Wall of China. We spent our last day in Beijing touring the Water Cube, Birds Nest, the Summer Palace, and Imperial gardens. This was our first encounter with an Olympic site and lived up to our expectations. Following this tour we made our way to the train station to board our sleeper train to Xi’an, which was quite the experience. We were welcomed to Xi’an by beautiful, thick snowflakes that made us feel at home. We were later led to the city wall for a long walk on top of it. We ended up having a snowball fight with some local children and our walk turned more into some friendly competition rather than exercise. As a group we made the spontaneous decision to get Chinese “foot massages” but it was really a full body massage that is used to relieve tension. We finished our day at a dinner theater with a 12 course meal of only dumplings, followed by a traditional Chinese dance show. The next day we visited the Terracotta warriors, and to our surprise, saw the French President and his wife. These warriors were life sized figures meant to protect emperor Qin in his afterlife. Our next stop was inside Pagoda park where we had a TaiChi class from a local master and after that we explored the Pagoda’s history, a mosque, and the Muslim Street Market. On our last full day in China we got the opportunity to visit a preschool/kindergarten and play with the kids. There were around 300 young kids and it fun to interact with them. This was a first hand experience showing how universal a smile is. Next, we landed in Seoul and were welcomed by the fastest internet in the world. In Seoul we first toured the 1988 Summer Olympics Stadium and met with the site manager who told us the history of the games, political implications, and notable competitors. We were then able to go out onto the track and take pictures, which was very memorable. From the stadium, we took the bus over to the Olympic park and the Seoul Olympic Museum, where we learned about the ‘88 games and saw artifacts from different years. The next morning we left Seoul for Pyeongchang and Gangneung, both of which held Olympic venues for the recent Winter Games. One of our last stops of the day was at a Buddhist temple in the hills. The area was home to many monks, including some people who are not full time monks and they come to this shrine and pay a small fee to dress and behave like monks for as long as they keep paying. We started our next day by heading to an Olympic Exhibition Hall in Gangneung; inside was a card from the IOC that revealed PyeongChang as the site of the 2018 Winter Olympics, replica of the torch, and examples of the medals. We then drove to see the Olympic ice sports stadiums and walked around the outside of the Hockey Centre, Ice Arena, and the Gangneung Oval. Our last excursion took us to Anmok Beach where one side of the street was coffee shops and the ocean on the other. The last full day in South Korea was spent in Seoul, some had the opportunity to witness the torch relay first hand and they said the atmosphere was unlike anything they had ever experienced before. The next day we made our way to the airport to catch our flight to Tokyo and after waiting almost two hours and stressing about missing our flight, it ended up getting delayed another hour which gave us a chance to witness the Vikings Minneapolis Miracle all the way from South Korea. We visited the Tokyo Dome and then rode the subway and ventured to watch the Sumo Grand Tournament which was quite the experience. The next day we took a sixhour bus ride to Nagano, Japan, home of the 1998 Winter Olympics. While we were here some took the opportunity to ski or snowboard in Hakuba, others ventured up the ski jump used during the Olympics, used an Onsen, and then shopped and spent time in the little ski town. As we made our way back towards Tokyo we stopped at the Snow Monkey Park. The park has been open since 1964 and gives visitors a rare opportunity to see wild monkeys in their natural habitat. Our final day in Japan was spent doing a variety of different things. Some continued to explore the city while others took the opportunity to visit Tokyo Disneyland which was the first international Disney. To end our trip there was a freak snow storm so our flight was delayed until the next day. We ended up staying in the Tokyo Airport with about 1,000 other people overnight before we were finally able to board our flight back to the USA.